Greetings from Sabah Tourist Association! 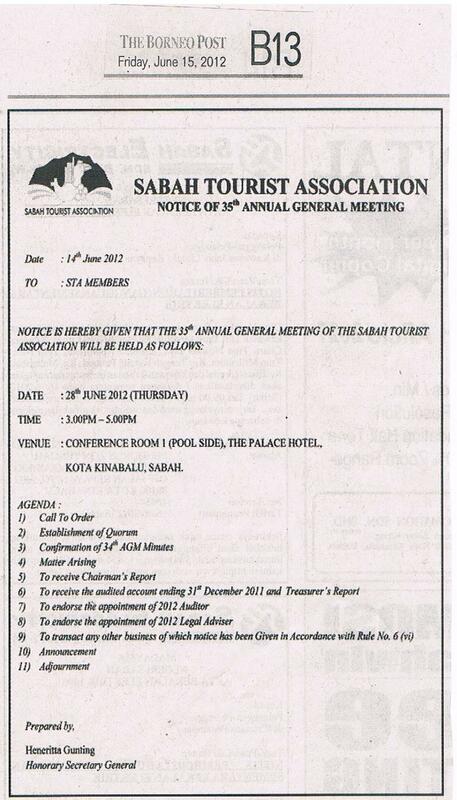 Sabah Tourist Association’s members are hereby invited to the 35th Annual General Meeting to be held on date Thursday, 28th June 2012, beginning at 3.00pm, in Conference Room 1 (Pool Side), The Palace Hotel, Kota Kinabalu, Sabah. Official Notice of Meeting has been published on 15th June 2012 in Borneo Post newspaper. We hope to see all of you at the AGM on the 28th June 2012.